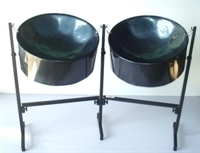 Our conventional, full-sized, steelpan collections cater for the individual player, small group or institutional band, as well as the orchestra. Each pan is tuned to exact tonal specifications at a standard pitch of A440, with provisions upon request for alternative pitch standards. Panland offers the widest range of products that encompasses all the various voice ranges of the orchestra. 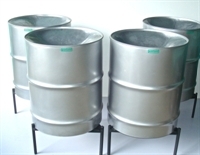 All Conventional Steelpans are hand made from 22.75 inch diameter drums which are manufactured using specified carbon steel. Notes are marked and lettered on all standard coated pans. Markings for other coatings will be done on request. A Certificate of Authenticity is provided with every Instrument which carries its description and Serial Number. 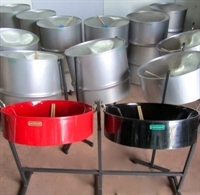 The High Tenor Pan is also called the D-Lead, Soprano or Melody Pan, and carries the melody in the steelpan orchestra. The Double Tenor Pan Set consists of two drums. This set of instruments is also called the Double Lead. Usually plays melody and counter - melody as it is an extended range of the Low Tenor Pan. 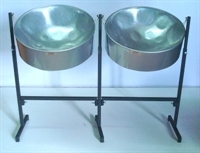 The Double Second Pan Set consists of two drums. This set of instruments is also called the Double Alto. Plays Harmony, counter - melody. This instrument set produces the accompanying chords to the melody, and has the strumming effect of a guitar. 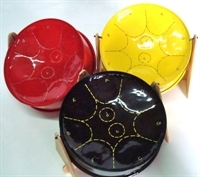 The 3-drum set of Cello Pans are the tenor voice in the steel orchestra and are used for low harmony and melody support. A variation of this instrument is called the Triple Guitar. The Four Cello pan set is also commonly called the Four Pan. An extended range of the Cello instrument using the combined sound of four drums, allowing for a greater role in an orchestra. The Six Bass provides the harmonic foundation of the orchestra. It has the lowest range and plays bass lines, giving it a full deep tone.